Stand Up Paddle Surfing: Surf trips, Motorcycles, shark infested waters and a gruesome injury! Surf trips, Motorcycles, shark infested waters and a gruesome injury! Wow! Lot of things going on with me lately- sorry to have neglected posting for such a long time. I'm gonna have to warn you- don't scroll down to the last pic if you've got a problem with looking at finger joints bending in an unnatural fashion. I was impressed with that Boga- it paddled great and it was actually really fun to surf. While I was up north, I got a chance to visit my brother Mike who lives in Santa Cruz- and the Ramble Machine was curious about Stanford so we stopped by to see if we could see Chelsea Clinton- guess we missed her by a few years. Trees were rad though. I think I'm gonna start another blog called "Mid-life moto Idiot"... as you can see, I'm know kind of hooked on motorcycles. Correct me if I'm wrong but don't most people get dirt bikes out of their systems by the time they're thirteen? Guess I missed out- I am messed up on these things... in a positive way. Anyway, here I am at my dirt bike class at the Honda Rider Education Center in Colton, Ca. so much fun! You know- I think I'm really going to start that other blog... I've got a lot to tell you about what I'm learning with motos! 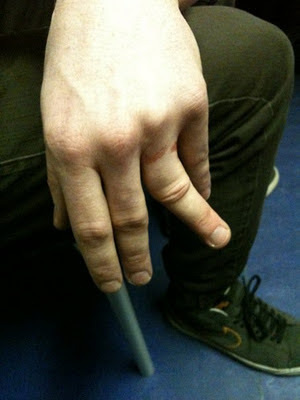 No, that's not my finger- but I did look down and see my digit bent like that. It freaked me out. And it hurt like hell. So now I'm sitting here typing in an awkward fashion (fingers taped together) wondering when I'll be able to grip my paddle enough to go for a surf (the Becky Stuart Memorial Race this weekend is out). The weekend surf report is looking promising so I know I'll figure something out... and I just HAVE to fire up my bike and go for another ride- finger be damned! gnarly John-grew up on motorcycles and had my share of wipeouts-not fun-i bounced when i was younger-now i just hit like a downed 747 and plow a ditch!-CD had a surf event at Davenport 2 years ago-SKETCHY!-then he broke his leash string and had to swim in-took him about 15 minutes-his and my eyes were like saucers-that place is freaky!-way to sac up though! Hey Jon- yeah, smacking down at 43 ain't the same as when you were 13... things break. I remember that contest at Davenport- tough conditions but your boy, of course, ripped. I would've been freaked to swim in too- we had a video filmer in the water swimming around the whole time- that guy deserves a medal!